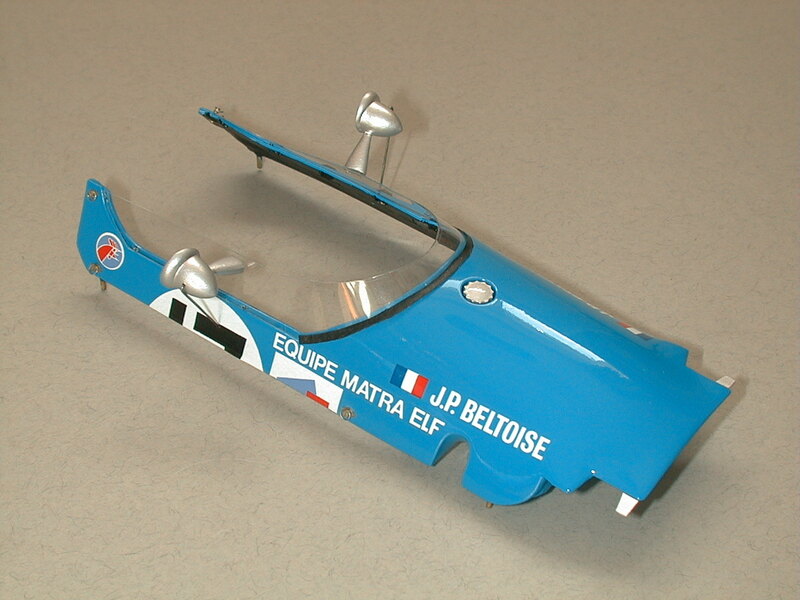 In 2000, I built a model of the 1968 all-French Matra Formula One effort, the car driven almost exclusively by Jean-Pierre Beltoise. 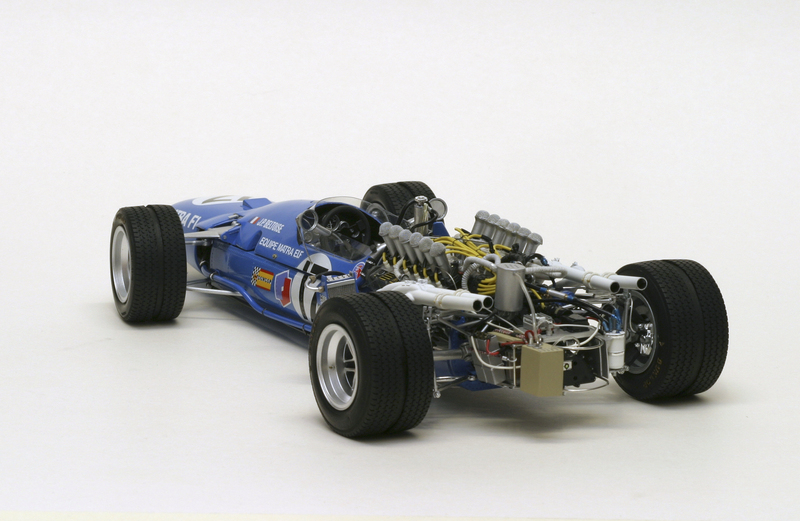 The 6o-degree V-12 engine with spine tingling exhaust note (especially from the debut triple pan-pipe chromed exhausts at the Monte Carlo) looked not-unlike an ever variable laboratory experiment, when compared with the tidy DFV MS10 alongside. 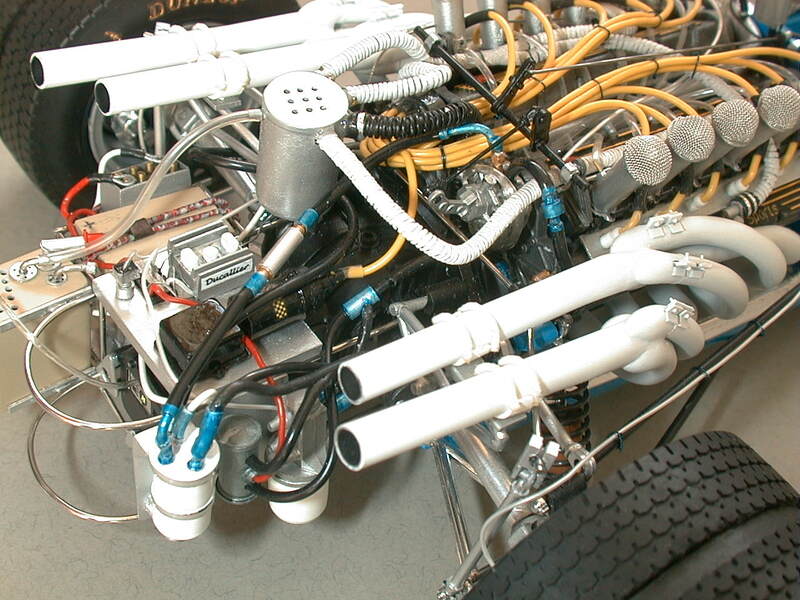 Not stressed, this engine sat in additional weighty bilateral rearward chassis extensions and overall the concept was a little too heavy and thirsty to compete with the DFV equivalents. Results were thin on the ground save for the second place behind Stewart in the Tyrrell entered MS10 in Holland. Having told the truth regarding its competitiveness, the car was a delight to behold and beautifully put together with all the cleverness of aerospace know-how. 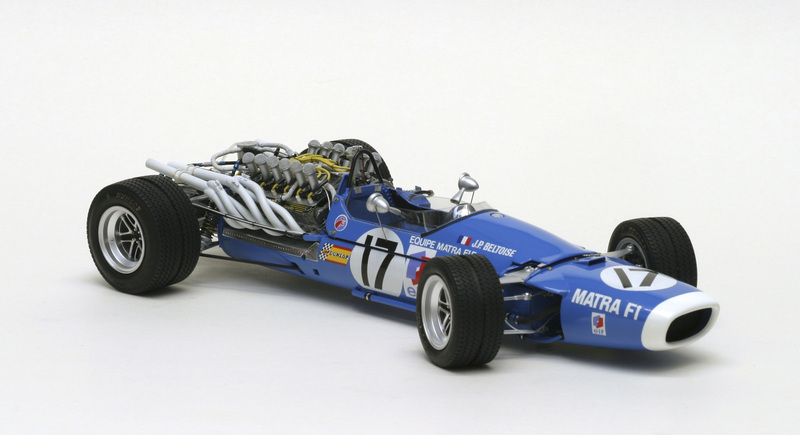 The Matra monocoque was constructed from sealed aluminium pontoons with numerous internal lateral bulkheads conferring great torsional strength. These pontoons were polymer resin sealed and provided in-effect bagless fuel tanks, unlike those of the other teams whose (internally less braced) monocoque sections allowed the stowing of fuel bags, the more modern (but not yet safe enough) way. It was a piece of the polymer resin that broke away and blocked a fuel pipe in the MS10 and robbed Stewart of a possible second place behind Hill (had Stewart beaten Hill, he would have won the Championship too). 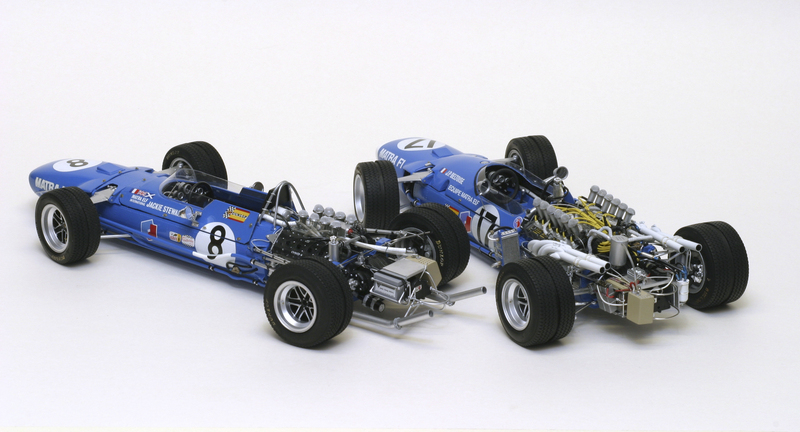 In order to fully appreciate the build, please View the PDF of the copyright article appearing in Scale Models Internationl. I originally built an MS11 myself in the winter of 1992/3, having acquired a fresh kit from Bob, at CarKits International (obsolete kits, Southend, Essex). This was rare prize, for these kits were very hard to come by (some time before the re-issue with corrected box-art) and I would have had to wait months even a year or more until one came up with ‘my name on it’, so to speak. I built it straight out of the box not knowing any better, nor being aware of what a real one looked like. I did restructure the forward cockpit floor, having committed to eliminating Tamiya’s electric motor and the necessary batteries which were contained in the cockpit. I did add brake lines and radiator hose clips, otherwise no other modifications. Naturally, I was pleased enough with it. By the year 2000, I had visited Goodwood Festival of Speed a few times and became ‘aware’ of how far off the mark some of these models were and I began to demand more authenticity and could begin to see a way of achieving this. Therefore, I was able to take a built MS11 (such as my own) and with aspirations borne from a set of LAT photos and a good book or two (I remember Alan Henry’s History of the Grand Prix (WHSmith publication), large format, as being especially good), I set about producing a better version of the MS11. If you want to see what a standard straight out of the box MS11 looks like, see Trevor Pask’s article in Scale Auto Modeller, Volume 1, Issue 11 Sept 1999, where Trevor has produced an honest representation of this fairly disappointing model. I carefully separated my weakly glued efforts and cut it up with sympathetic surgical precision where needed, to give myself a set of lovely new parts to bring together in an invigorating and refreshing way, to copy as closely as possible the feel and character of that car in 1968 which so captured imagination with its exhaust note and extravagance of engine and all that lay behind the driver’s shoulders. I had never seen a real car, let alone measure anything, so this was an exercise purely of judgement by sight, …did it ‘look right’? I’ll leave you to judge that, but I am happy to leave the tape measure at home until one day I might re-visit the project perhaps,… perhaps not. I particularly wanted to capture the pugnacious image of the car, the tidy enough but overly busy laboratory-like rear end of the car, the accuracy of certain details as shown on the LAT photographs compared to the original kit I wanted to reproduce. The contrasting approach to safety was apparent in that the Stewart MS10 would have seat belts and these would be absent on the MS11, as they were not yet compulsory (until 1969). I enjoyed the adventure of the new decals I had to produce, the experiments with tyres, (central tread cut out), the Heath Robinson oil cooler on the left side of the monocoque, the risky production of the long range fuel tank adapted cockpit surround, new steel suspension parts and many scratch-built extras making my model unique. All these things were really exciting over ten years ago now and they have stood the test of time. Correspondence came as a result of their publication and through this I met a good friend Allan N from Denmark who I meet every year at the Festival of Speed. This model amply illustrated the contrasting approach between the French way of doing things and the English presentation of a car, namely the MS10. Both are beautiful, together they are sensational. If you like this website (and who wouldn’t), you’ll love Mark’s book “MRO F1 Engineering the first twenty years” which covers more articles about Mark’s love for model building and his passion in contacting and sharing this love with fellow modelers and personnel in the F1 world. There’s also information about Mark’s meetings with famous F1 drivers, team members, etc.. But the presentation of the models is what makes this book worth every penny. It’s very hard to decipher between the model and the real car! The amount of detail on these cars instills me to dream and exceed in building the ultimate model. He also honors those contacts that are no longer with us. Cherished wealth of information that is gone forever but honors them so that they will never be forgotten. I can’t wait until he completes the second book. Thanks Mark for a job very well done…. Thanks Glenn for for saying a few helpful descriptive words re the MRO F1 Engineering book which you have now received in the US. I’m delighted you have enjoyed receiving and reading it and that these thoughts are how you found the book from your perspective, rather than my own ‘take’. Having lived the book for several months, I see it from the context of how the last twenty years of the interaction between the modelling and the real F1 world, actually was, so it’s good to see how that comes across to a genuine reader. Thank you too for tip re Archer rivet decals (Surface Detail) most suitable for the Matras, in your opinion. I will include these in my next order following your recommendation. Thanks Glenn for kind observations. 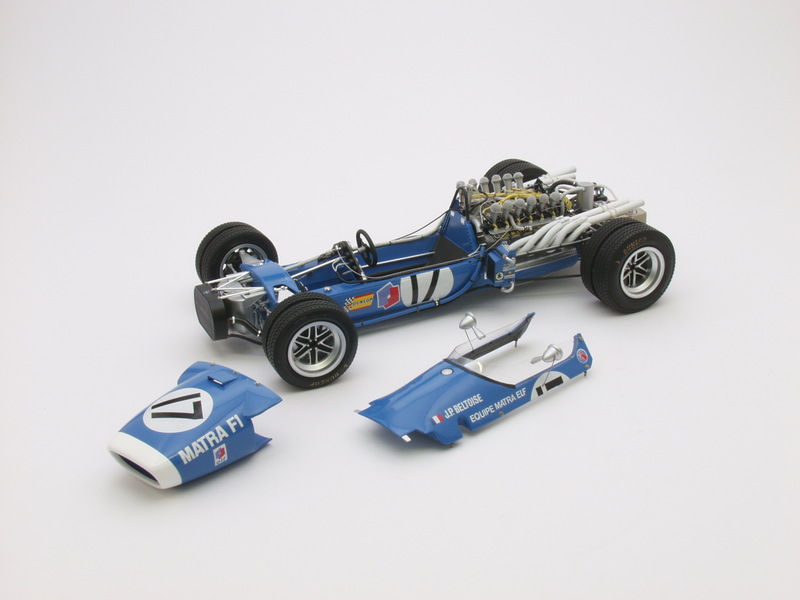 The model details were based on those observed on LAT photos and reproduced as best I could see, pictures being selected from the Dutch Grand Prix in 1968. The engine detail came from a photo on page 226 in William Boddy’s The History of Motor Racing. So the detail has very strong foundations in fact and if you or anyone you know is sure of the plumbing and function of the oil/fuel or other cooler on the left hand side of the car, I’d be grateful for opportunity to learn.